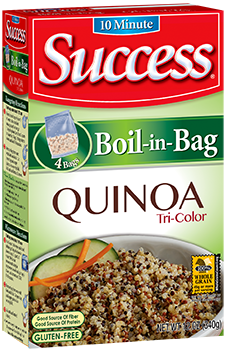 Success® Rice, the ORIGINAL Boil-in-Bag rice, is a product of Riviana Foods Inc. located in Houston, TX. Success Rice is currently the market leader in Boil-in-Bag rice products. 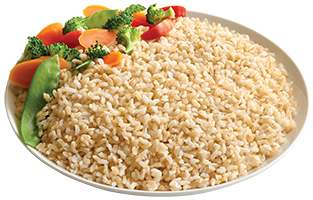 Success Rice is available in a variety of sizes for larger households. An excellent source of complex carbohydrates, fat-free, cholesterol-free, and sodium-free … Success Rice products are guaranteed perfect and make it easy to provide health and nutrition to a well-balanced diet. Pour about 1-quart water into medium saucepan and submerge 1 bag of Success® White Rice. Bring water to a boil and boil uncovered 8 to 10 minutes. 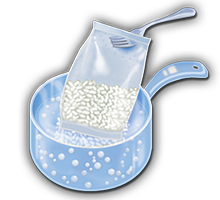 To cook multiple bags: Pour 3-quarts water into large saucepan and submerge 2 to 4 bags of Success® White Rice. Bring water to a boil, and boil uncovered for 8 to 10 minutes. Follow Step 2 to drain and serve rice. 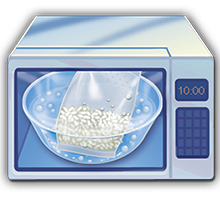 In a 2-quart microwave-safe dish, submerge 1 bag of Success White Rice in water (about 1 quart). Microwave on HIGH 10 minutes. 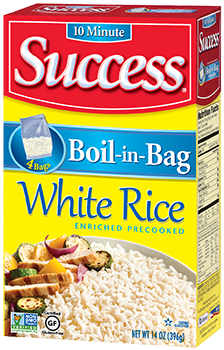 To prepare Success® White Rice "out-of-the-bag", click here for more information.